Hi everybody! I don’t know about you, but I can’t wait for Injustice: Gods Among Us Ultimate Edition on PS Vita next week. 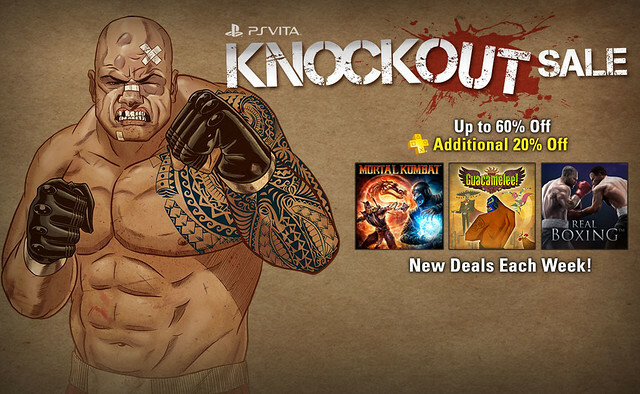 To prepare for this game’s imminent arrival, we’re offering discounts on some of our favorite PS Vita fighting games. Tomorrow, we’ve got a set of discounts on PS Vita fighters (with a new batch of discounts next week), with prices up to 60% off. PlayStation Plus members get an additional 20% off. Visit PS Store tomorrow to take advantage of the first week’s deals, and check back on November 12th for the second week of sales. Let us know which games you are going to pick up in the comments! I need to start waiting on sales. Going to pick up Divekick and KickBeat. Meh, I’m not much of a fighting fan, unfortunately. Guacamelee is th eonly game here that I would have bought, and I already have it. BTW, should SoulCalibur be listed both weeks? … And about the DLCs of this games??? No Discounts? Also, will SoulCalibur be on sale for both weeks or is it a typo? Glad i picked up the digital version of DOA5+ for $10 when i did. Maybe I’ll pick up the digital version of Mortal Kombat especially since i’m expecting my 54gb memory card from Play Asia. I already own retail copies of MK and DOA but i plan on giving them to my brother when i buy him a Vita in the future. I would for sure pick up Guacamelee! for that price. That game is tons of fun. Getting it for half price would have made it a sweeter deal, but I couldn’t resist the launch week discount and getting it right away. Kickbeat for sure. It’s the only one I don’t have. And I must support Zen Studios. They are a really great studio. Guacamelee is a steal at this price. It’s the only game I have ever cared to do speed runs on. @4 agreed, need those games to be on sale as well as others like Tekken 6 (PSP version). Either way, keep up the sales Sony. I LOVE MY VITA! Great system. So getting Guacamelee and MK for the VITA! Hmmm…. the ones I would have wanted I already got for less. Sadly, nothing for me. Own most for less. I’ve had my fill on fighting games for the vita over the past few months. I’ll be in the corner, over there ->, waiting for a JRPG or RPG sale. Already own Guacamelee! (my favorite game I have played on the Vita to date) PS All Stars, and MK, which are the only two games I am interested in for this sale. But I do love that you have a Vita sale! Keep it up. Its just that I am not looking for the other games that are on sale this time. I have most of those already, but I’ll probably pick up Atomic Ninjas at that price next week! Nothing for me. I already got MK for $5 on a previous PS+ sale only two months back or so, and the only other game here that interests me is Guacamelee, which, judging by how cheap I got MK, I’ll gladly wait. Like others, I’m waiting on NFS:MW,Muramasa Rebirth, and DJ Max to be on sale. All that I’d be interested in I own already. Kinda scary. Anyone who want’s play station all stars cross buy. Get the ps3 physical copy new, it’s $20 on GS and you will get a code for the vita version. Wish there was an rpg Vita sale like this instead. I would like Mortal Kombat Komplete Edition 75% off. Should I wait for UMvC3 to go lower, perhaps during Black Friday? Been waiting for a good price drop on it, but not sure if they might lower it later this month. Thanks! So if we buy Divekick now we can play it on the PS4 once it’s released? According to Greg Miller (IGN) Divekick will be on PS4 Day 1. Serious guys? Broken Destiny was for free, MK was for $5, PASBR was a long time ago for $10 and Guacamelee was for $10 months ago. Where on Earth is Runner 2 for Vita!! Month by month keeps slipping away and still no Runner 2? Lots missing here… also kind of weak discounts. I find the lack of good deals here…. disturbing. Hopefully PSN does a “Black Friday” sale so I can buy games digitally too. Guacamelee! for me with my October reward. Ahora que tengo el Vita desde hace poco no hay nada mejor que Guacamelee!, gracias a Dios que no lo compré en éstos días y ahora por ese precio no lo puedo dejar pasar. Muchas gracias Sony. Ahora a la espera del PS4, y ya tengo mi copia de Killzone Shadow Fall. Just Guacamelee! and Divekick for me, mainly because they’re Cross-Buy (and Guacamelee! has cross save). Otherwise I probably would have just waited for a later sale. Nothing for me this time. I got a few questions. 1) Any chance of Sound Shapes going on sale anytime soon? 2) Any PS4 INDIE pre-orders before launch going to show up? I’d love to have some ready and paid for. Good deals for sure for those that want to save some money. Reality Fighters has been on my wishlist for a long time. I’ve got a funny feeling it’s going to show up free on psplus. I’m thinking about buying it anyways I don’t know. I plan to renew at the very last of the month to get binary domain and odd world, but if I’m getting reality fighters that extra 20 percent sounds good. Though I’ve got Gundam Breaker Vita on it’s way in the mail right now. :) I’m supper excited about that one. guacamelee is a must have for vita. Considering how many fighting games we have been swamped on PS Vita with PS Plus it makes sense. Guacamelee was awesome though! I’ve already got Guacamelee. The only other one on these lists that interests me at all is Kickbeat, and for $5.59 with Cross-Buy, I’ll go ahead and grab it. And it’s on sale after we get our credit from the last sale promotion, so I won’t even have to spend any of my own money on it! YES! A discount for Kickbeat! I can finally rejoice and relieved to get it much cheaper! Not sure about the rest of these games but you should definitely buy Guacamelee! and then spend the money you just saved on the awesome soundtrack.